In Sanskrit, "vaayu" connotes 'air'. 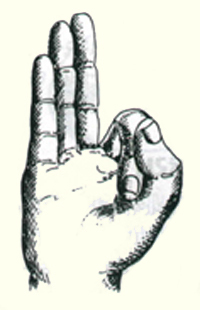 Air element of the body gets properly balanced with this mudra. Fold the index finger and place it on the thumb pad. Put your thumb over it and press lightly. Keep the other fingers apart. You can get relief from all kinds of pains and aches. It provides relief to patients of Cerebral Palsy and Parkinson's disease. Nervous system functions better with regular practice.